I'm sitting in the bar at a seasons 52 while on a business trip to Cincinnati when I suddenly realized I walked in here and sat down by myself without even thinking about it. As much as I've traveled for work over the years, I have never eaten in public alone - I guess I never wanted to look like the lonely fat girl eating by herself even though I wasn't (well I was fat but not lonely)! I did happily eat whatever I wanted, alone in my hotel getting fatter by the minute. This is a new level of confidence for me that was kind of unexpected. I've always thought of myself as confident, even at 250 pounds, but as I experience this I realize that it wasn't real - I used it to try to fool myself into thinking I was fat and happy. Some people are but I'm just not one of those people. My dad was a frequent business traveler and I just can't stop thinking about how proud he would be of me right now! 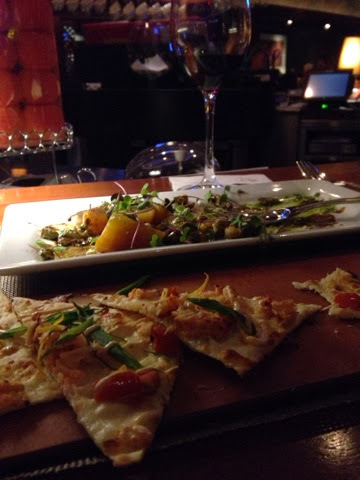 That's my lobster flatbread, beet salad and a glass of wine. Eating alone with a small stomach means lots of leftovers! Heading home tomorrow! I have a feeling this year is going to be full of fabulous firsts!